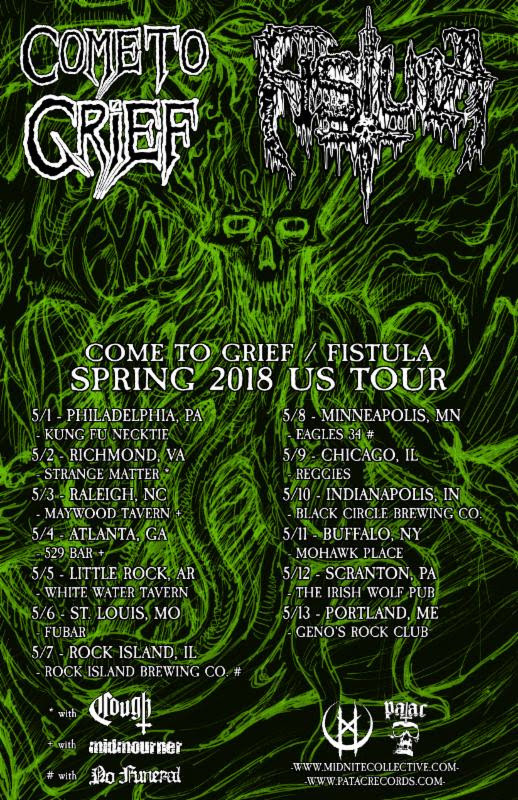 Ohio sludgecore veterans FISTULA have confirmed a spring tour this May with fellow sludge stalwarts Come To Grief. The soul-crushing journey will commence on May 1st in Philadelphia, Pennsylvania and trample thirteen venues through May 13th in Portland, Maine with Cough, Midmourner, and No Funeral to appear on select shows. See confirmed dates below. FISTULA recently issued the first wave of an ongoing split seven-inch series celebrating twenty years of sonic misery. Released via PATAC Records, the first two installments find FISTULA sharing wax space with Come To Grief and -(16)-. The band’s split with Come To Grief features two original and categorically scathing unreleased tracks while the second features -(16)- ‘s cover of “Complications” by Killing Joke and FISTULA‘s rendition of “Mongoloid,” by Devo. If you missed it, stream both splits via Decibel alongside an in-depth interview with guitarist Corey Bing, at THIS LOCATION. Each limited edition seven-inch is available in various color variants (all clear vinyl is sold out). The Come To Grief / FISTULA split is also available on cassette. To order, visit THIS LOCATION. FISTULA will unveil additional splits with Hemdale, Fister, and one final band to be announced at a later date. Additionally, the band will issue a vinyl version of 2016’s Longing For Infection with a bonus etched seven-inch from the recording session. Details to be announced in the coming weeks. LONG LIVE COME TO GRIEF. This entry was posted on January 21, 2018 at 4:30 pm and is filed under Hard Rock, Heavy Metal, Metal, Music, music news, news, rock music, world news with tags concerts 2018, fistula, Heavy Metal, metal odyssey, rock music news, sludge metal. You can follow any responses to this entry through the RSS 2.0 feed. You can leave a response, or trackback from your own site.